Thanks to an innovative tertiary treatment package from Xylem Inc., the city of Galesburg, Illinois, has been providing residents with a very innovative, green and economical solution to their wastewater needs since 2010. In 2008, the city was seeking an economical way to improve their wastewater treatment needs and reduce Total Suspended Solids (TSS) concentrations, especially during high flow conditions when solids could wash out from the processes. To achieve this goal, the city council approved funding for a new wastewater treatment plant, and Xylem became part of the “solutions” team. The Galesburg plant has an average design flow of 11 million gallons daily (MGD), and peak design flow of 28 MGD. 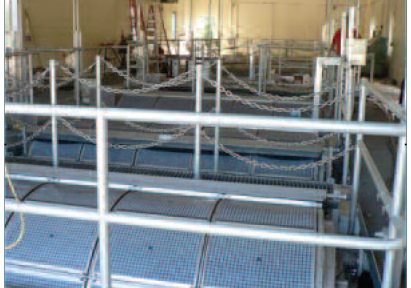 To meet the needs of the plant, Xylem installed an innovative system for the facility. The system uses a Sanitaire DrumFilter and Flygt controls for the submersible lift station pumps. While a Bell & Gossett Triplex 70VS Variable Speed Booster Pump system operated by a Technologic® 500 Pump Controller and variable frequency drives (VFDs) is included to boost water pressure. During normal filtration, no energy is consumed by the system. Effluent flow is polished by the DrumFilters after leaving the final clarifiers with 17-micron filtering screen. The Flygt variable speed submersible lift station pumps in sequence on and off to match effluent flow feeding the DrumFilter system. Only when a backwash cycle is initiated does the DrumFilter system use energy. The filtering process is not interrupted during the backwash cycle, which is when the 70VS system starts the lead pump by detecting a drop in the backwash line pressure. The system has the ability to sequence additional pumps as required to meet system demand and maintain the design pressure required to spray away the solids. The system was designed so that the third pump in the sequence was designated as a standby unit. The Technologic’s automatic alternation of the lead pump balances the wear on each pump. In addition the 70VS provides remote run and alarm status indication to the Flygt monitoring and control system to ensure total system integration of the Xylem products. The 70VS system with Technologic controls integrates seamlessly with the DrumFilter to provide an energy-saving tertiary filtration solution. Thanks in part to this solution from Xylem, the city is now reporting effluent concentrations of less than 5mg/l. Xylem’s Applied Water Systems (AWS) comprises global brands that work together and deliver premium products, comprehensive solutions and unmatched application expertise to meet the demanding needs of growing populations, communities and industries. The range of energy-efficient pumps, boosters, drives, valves, controllers and water systems support numerous applications in building services, general industrial, food and beverage, marine and agricultural markets around the world. Xylem (XYL) is a leading global water technology provider, enabling customers to transport, treat, test and efficiently use water in public utility, residential and commercial building services, industrial and agricultural settings. The company does business in more than 150 countries through a number of market-leading product brands, and its people bring broad applications expertise with a strong focus on finding local solutions to the world’s most challenging water and wastewater problems. Launched in 2011 from the spinoff of the water-related businesses of ITT Corporation, Xylem is headquartered in White Plains, N.Y., with 2011 revenues of $3.8 billion and 12,500 employees worldwide.